This walk takes in all the bridges of Malmesbury where they cross the Sherston and Tetbury Avon rivers. We have published a walking guide in booklet form which includes all the information about the walk including maps and pictures of things to see. 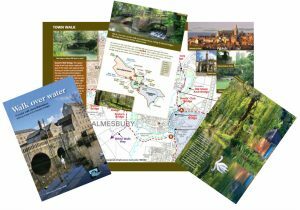 The guide is available from Malmesbury Tourist Information Centre – price £1.00. This project has been largely funded by former Malmesbury Mayor Steve Cox’s mayoral fund with some additional funding from Malmesbury Town Council. All profits from sales of this guide will be reinvested by MAP into the development of future walks projects.